Allison & Tim's South Bend Wedding at Christ the King & Morris Park Country Club! This past weekend we photographed two full weddings in Indiana and Michigan on Saturday and Sunday. The week leading up to these two weddings was our busiest of this entire year (and of all of the past 10 years of October wedding photography). During the week we edited an entire wedding and an Engagement Session, met with a couple in Chicago, started the season of volunteer coaching middle school volleyball, scouted portrait locations with our Sunday bride Sara at her Michigan venue, location scouted FOUR locations for possible indoor portrait spots for Allison and Tim (since it called for Saturday rain all week for the duration of their wedding), prepped the umbrellas for Saturday, prepped the studio furniture for Sunday, tweaked wedding schedules, made more wedding contracts for 2019 couples & sent them out, finished up designs of Save the Date and Christmas Card designs for a few of our couples, printed Engagement Session photos, delivered Family Portrait Session photos, etc. Needless to say we barely slept much and were ready to tackle the weekend of back-to-back full weddings! Our first wedding of the weekend was Allison & Tim. Allison and Tim live in Cincinnati, Ohio and have known each other for 10 years (and started dating almost 7 years ago). We started chatting with Allison and Tim nearly a year ago at the start of December 2017 and met with them in person in our Consultation Office that same month! We found out that like Jenny, Allison also went to the same schools of Christ the King elementary school and St. Joe High School here in town and that they had many mutual friends! We even found out that one of Allison’s parents’ neighbors (and a friend of Allison) was one of Jenny’s volleyball players that she was coaching in their second season at that point-! Allison told us that they chose their venue Christ the King church since she went to elementary school there and then their reception of Morris Park Country Club because her parents belonged to the club while she was growing up, so she swam there during summers and also golfed there a lot with her dad. We also learned that Allison and Tim started dating while in high school, that Allison is a teacher, that Tim is an engineer, and that while dating in college (a state apart) they saw each other about once a month. After meeting last year we kept in touch throughout this year with them keeping updated on Allison’s job transitions and their travels/ plans. We even helped sort out a cohesive wedding day schedule for photographing and kept in touch about weather leading up to their Big Day! 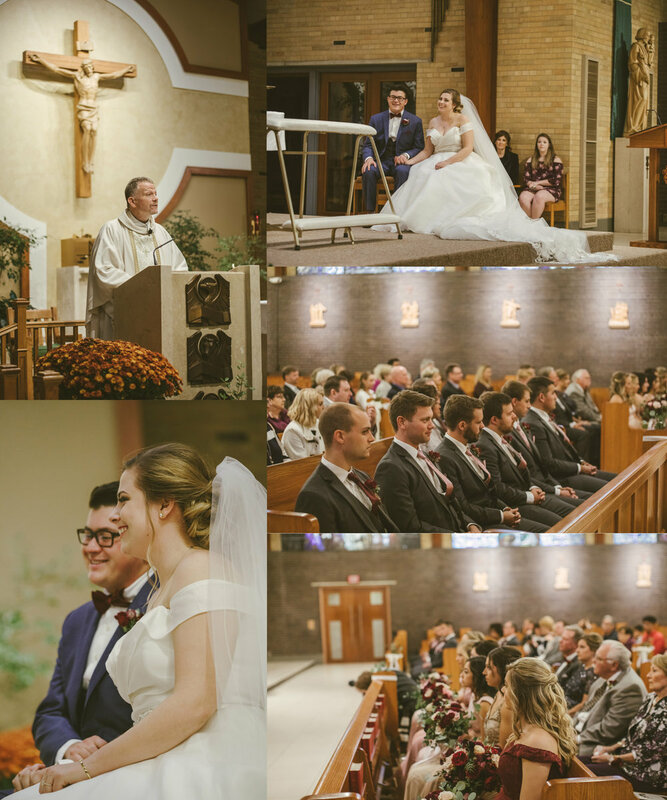 Soon it was Saturday October 20th, 2018 and time for Allison & Tim’s wedding! 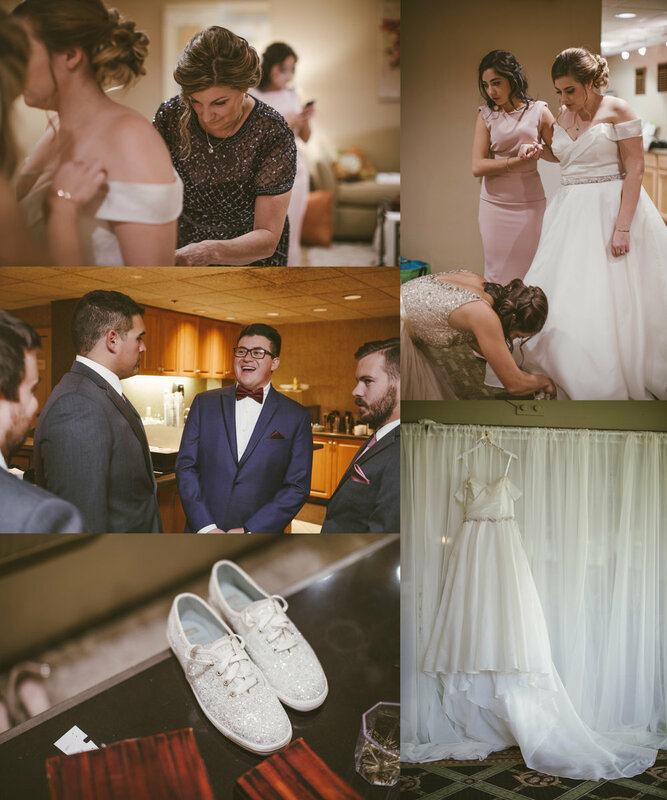 Their reception was at Morris Park Country Club, so both of them, their bridal party, and parents got ready there keeping Allison and Tim apart prior to the ceremony. We were there to capture some portraits outside (if we could given the weather) and made sure to keep Tim and Allison apart from one another during photo times by using our walkie talkies. Though it called for rain starting at 11 a.m., the rain held off when we got there at 12 and we were gifted this bit of time with no rain. Jason took the guys out for groomsmen portraits with Tim very quickly after their short preparations since we didn’t have much time while Jenny went down to the locker room to capture photos of the girls. In the one short hour Jenny lightspeed captured Allison’s dress, the bridesmaid dresses, the girls in their matching shirts, they and their matching water bottles, Allison and her mom, and other details before the girls helped Allison into her bridal gown! The gown was on before we knew it, her mom helped her with the veil, and Allison even wore her necklace and earring that were passed down through the generations to her! 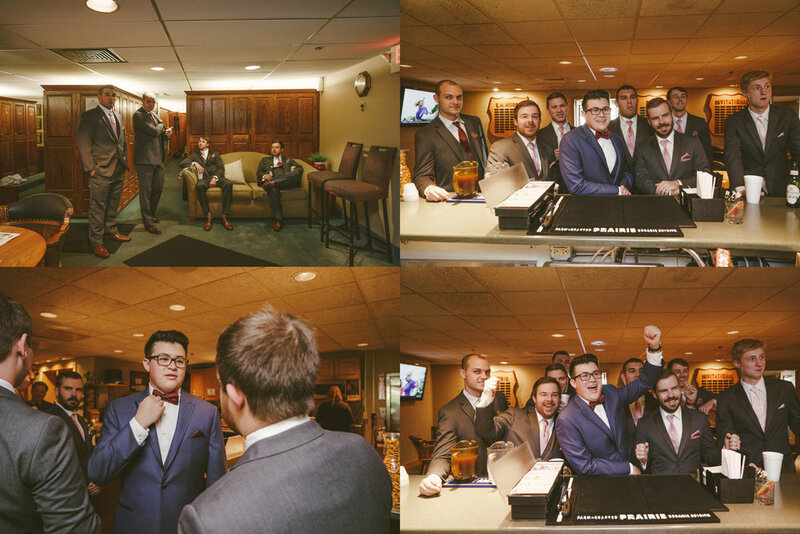 The guys when finished getting ready they watched some sports on tv, then headed out to the golf course for their groomsmen portraits (which we’ll include in the post-ceremony bridal party photos a bit later). Allison also did a reveal with her dad which was heartfelt and got her misty eyed. She even gifted him a note and had him read it then and there. It was a beautiful quiet moment before 5 minutes of portraits down on the golf course, then heading off to the ceremony. Since there were about 5 minutes left before heading to the church, Jenny got Allison and all of the girls into golf carts and took them to our favorite spot at Morris Park Country Club for some portraits as planned. The wind started whipping through the valley that they were in, but there wasn’t any rain yet and things were relatively dry! Jenny somehow got all of the portraits of Allison and her bridesmaids (and parents) as well as individual photos of Allison finished up in about 5 minutes (a literal record for all of those portraits within the past 10 years of wedding photography- something we usually allot an hour to 2 hours for later in the day) and got them all back to the club house so they could hop in their limo and we could all meet up again at the church about 10 minutes away! The clouds loomed ominously over the church when we got there, but there was still no rain by early afternoon. We gathered all of our umbrellas that we provide to our wedding clients and made sure to bring them inside and store them at the back of the church for the bridal party when we expected it to downpour after the ceremony. Once we got inside it was immediately time for Allison & Tim to pray together still hidden from each other by a doorway. They prayed emotionally together and it was about time for the ceremony! After their prayer they had about 20 minutes for final preparations before heading down the aisle! Their bridal party helped get them all ready and they even got to mingle with a few special guests! The bridesmaids and Allison’s mom prayed over Allison before she headed off to get married and Allison’s dad gave Tim an approving handshake before it was finally time to head down the aisle! The Catholic ceremony was beautiful. The ceremony itself consisted of all the traditional pieces of a Catholic Nuptial Mass, beginning with the procession of the bridal party and adorable ringbearers/flowergirls before Allison was revealed to the crowd. A huge smile came across Tim’s face once he was finally able to see Allison in all her beautiful bridal attire. Allison’s dad handed her off to Tim and the bridal party gathered around as Allison and Tim stood side-by-side near the altar. The priest shared a few words and a song was sung before everyone was invited to take a seat. The priest gave his homily as Allison and Tim listened, laughed, and intently took it all in. These two also got “lassoed” while kneeling during the ceremony. A two hooped rosary was placed around them by their god parents as a symbol of the couple’s unity. This tradition is common in Mexican, Filipino, and Spanish weddings and this was our first time witnessing it. They also enjoyed the standard mass eucharist and were also able to show a sign of peace to their bridal party and loved ones. They also (as almost all of our Catholic couples do) did do a veneration of Mary near the end! During the Catholic mass, vows and rings are exchanged earlier in the ceremony amidst a full hour Catholic mass, but for our photos and story telling we placed them near the end right before their first kiss as a married couple (instead of right after the Veneration of Mary as it actually went). With that kiss the ceremony was over and they headed back down the aisle a married couple! After the ceremony Tim & Allison signed their marriage license and we began family photos immediately after! The photos flew by and near the end we captured some photos of just the two of them together at the church. Soon it was time to hop back into the limo, though. We were happy to be able to capture some portraits of the two of them married in the church as we weren’t yet sure how the weather was looking post-hail/ rain outside and didn’t know if there’d be dry weather for portraits of them in the outdoor location at all. Luckily after we wrapped up these portraits in the church, there there was still no rain as the bridal party went outside (as it’d hailed and rained during the hours that they were in the church)! They didn’t even need our clear umbrellas to get into the limo (though we did load them into the limo for arriving to the University of Notre Dame)! As luck would have it, we did still manage no rain, hail, or snow once we all got to the portrait location of Notre Dame’s grotto shortly before 5 p.m. and didn’t even struggle too much with the Garth Brooks Notre Dame concert traffic (though the concert gates had opened that very same time)-! We only had 15 minutes, so we stuck to Notre Dame’s grotto and were so happy that we got these additional photos during less than 10 minutes earlier in the day at Morris Park (pre-ceremony)! Jason even took Tim’s request and created a fun scene of the groomsmen in Star Wars with the AT-ATs chasing them (maybe his best wedding work to date). Earlier in the day around 1 pm Allison even got to have a few portraits taken outside of she and her parents and she with a beautiful wedding portrait of her grandmother. Tim also got some solo portraits taken at this time too-! The wind was pushing in the cold air at the University of Notre Dame’s grotto while we were all there around 5 pm, but the sky was dry for a moment as we utilized our full 15 minutes for the full bridal party photos and finally outdoor portraits of Allison and Tim married-! Everyone was cold, so we didn’t push it, but we knew that we wouldn’t be able to utilize Morris Park for the additional 45 minutes of portraits as planned when we returned to the reception (since the sky was turning black again and we knew more bad weather was on the way) so we made sure to capture the most important things on their list! Luckily in total we had had about 5 to 7 minutes with the bridesmaids & Allison in the morning on the golf course (while Jason captured Tim & his groomsmen on the golf course at the same time) AND those 15 minutes at Notre Dame’s grotto… all full of wind, but luckily dry which was a miracle! The total less than half hour for wedding portraits was the least amount of time we’ve ever had for bridal party and couple portraits during a wedding day (usually we schedule about 2 hours total for these & travel to the various locations), but we were extremely thankful that we were able to capture everything within less than 30 minutes total in the beautiful outdoor locations AND capture most of the photos of Allison’s 100 inspiration photos-! We’re so happy that we got so many photos of Allison and Tim outside at Morris Park, portraits of them together at Christ the King after their ceremony, and their requested spot of portraits together at the University of Notre Dame’s grotto as they’d wanted-! When it had called for rain from 11 a.m. through the entire night we’d planned to have 4 back-up indoor spots, but we’re so happy that although not perfect conditions, we still got photos of them at all of the spots without too much concert traffic or the rain, snow, or the hail that happened at different times throughout the day-! Once we were finished up at Notre Dame, everyone hopped back into the limo and we all headed to Morris Park for their reception! Celebratory champagne & their own music in the limo were musts. As expected the cold rain/ hail/ snow started up once everyone got out of the limo and into Morris Park Country Club, so we put our umbrellas away and cancelled the 45 minutes of photos on the golf course which was fine since we’d planned for that and made sure to capture all bridal party portraits in every dry moment we got outside earlier! Instead of more portraits, Allison and Tim got a private room reveal of their wedding reception fully decorated while guests enjoyed cocktail hour! It was extremely gorgeous and we loved the color scheme, flowers, and decor so much. There were so many details all around Morris Park for their reception! We don’t think we’ve ever photographed so many decorations at a Morris Park wedding reception and it was beautiful to see how it all came together! We especially loved the framed Love Story dates below! We love that the dates are memorialized like this because often not many people know when you started dating, got engaged, or got married! We definitely suggest this cool detail for any engaged couples-! Many guests including Tim’s mom also enjoyed a book that they put together about their love story! It was a very cool book that talked about when they actually met back in 2010 and their evolution as a couple. Another one of our couples made one of these last year and we love them! During cocktail hour guests enjoyed taking polaroids and collaging them into an album adding kind words next to the photo, highlighting their favorite Bible verses in Allison & Tim’s Bible, and looking through Allison & Tim’s viewmaster while the violin player played some beautiful live music! Since we didn’t get this time for portraits outside, we snapped some fun photos of Allison and her bridesmaids before they bustled her! The girls bustled Allison’s dress while we photographed all of the details around the reception and everyone enjoyed cocktail hour! We had only been about 25 minutes early to Morris Park due to the cancelled additional portraits, but all of the bustling, cocktail hour, and detail photos of the reception actually took that amount of time, so it worked out perfectly! Once cocktail hour was finished, everyone made their way to their tables and Allison and Tim were officially announced into their reception! Immediately after being announced in Allison and Tim had their First Dance. After their FIrst Dance, these two did their Cake Cutting! They fed each other sweetly, then Tim added a bit of icing to Allison’s nose! Salads were served and guests were thrilled. Allison’s dad welcomed guests and gave a speech. It was heartfelt and made them cry which showed their love for one another. Following his speech were the Maid of Honor (one of Allison’s sisters) and Best Man speeches (Tim’s best friend). These toasts also elicited tears from both Allison and Tim as funny stories were told and laughs were had. Dinner was served and we began to style and photograph very close-up photos of their rings and their cute shoe details prior to enjoying the fantastic dinner for a few minutes. (We’d captured portraits of them to the side at the reception since we didn’t get the 45 minutes to do so earlier due to rain, so at the end of this blog we share all of those together.) Also during dinner Allison & Tim greeted their guests at each table and were able to unwind a bit. Once dinner was finished we had less than 15 minutes left with them, so Allison & her dad enjoyed their Father-Daughter dance. Tears were had, hugs were given, and all-in-all love was felt. Tim also shared his Mother-Son dance with his mom. She too was overcome with emotion as she slow danced with her son and it was a beautiful time. After their Father-daughter and Mother-son dances, everyone enjoyed a drink, then Allison did her garter toss! After the garter toss, we captured everyone Photobombing Allison and Tim on the dance floor for about 5 minutes straight and then helped them capture a selfie with all of their guests before we packed up to leave! As we were packing up and leaving, the live band Justin Staublin started and we snapped an additional few photos of them and Open Dance starting! We grabbed a piece of C’est la Vie cake (best cake around- pistachio & champagne flavors by Courtney) and we were off. As a parting note, here are some final photos we’d like to close on that we captured earlier in the reception of they and then their rings at Morris Park! Congratulations again to you, Alli & Tim on your first 4 days of marriage! We hope that you two enjoyed the rest of your night on your wedding day and that you’ve had a great 4 days of post-wedding glow since then. We can’t wait to finish up editing your wedding over the next month and get you your hundreds of printed photos, Keepsake Box, & then see what additional photo products you get with your Print Credit! Unrelated: Coming up next week we’ll be sharing Sara & Chad’s wedding Teasers here on the blog! These two got married a few days ago at the Morris Estate in Niles, Michigan and are on their warm honeymoon tropical cruise all of this week, so when they return we’ll be creating their blog to share with them! We have four full Fall Family Portrait Sessions and Engagements to capture in the next couple weeks, but first we’re heading up to mid-Michigan the middle of tomorrow through mid-Monday! We’re wedding photo editing through the night, volunteer coaching late this evening, then start printing Save the Dates and Christmas cards before we head out, so there’s not a second to spare (so packing may cut into sleep time)! We’ll be editing 3 weddings and these 4 Sessions through ALL of November, then creating the 9 wedding albums and over 1,000 printed wedding photos for 7 of the couples in December! Needless to say we’re happy to have these 4 nights in Pure Michigan starting tomorrow afternoon before more photo work, coaching, Halloween candy passing, and a few Family Portrait Sessions to capture next week!